I recently bought Nikon's 'entry level' D50 digital SLR for general photography but was also interested to see how it performed on a LOMO microscope as my present digital imaging route with a Sony S75 digicam wasn't ideal. 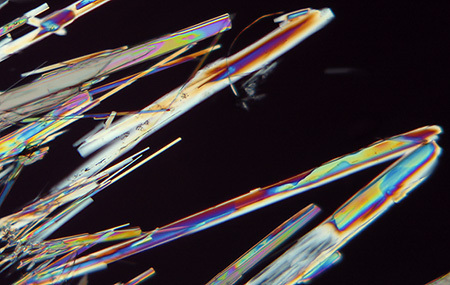 Flash was used exclusively to bypass the potential vibration problems of a camera directly coupled to the microscope. Camera shake can apparently remain a problem even with mirror lock, as my brother's trials of a Canon 350D on a Zeiss Axiostar have shown, so the vibration of a D50 which has no mirror lock on a lightweight LOMO microscope could be worse. The flash set-up was described in last month's Topical Tip. I used a very simple monocular set-up which I was familiar with for both a film camera and consumer digicam. 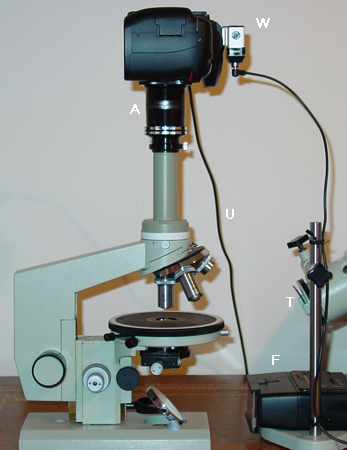 I like the simplicity of this set-up for static subjects despite the potential critical focussing problems and is also one other users of older microscopes may be presented with because maker's photo equipment was either never available or hard to source. I have recently acquired the LOMO trino' head secondhand after many years looking (thanks Mark! ), which should be a better final solution but I was still 'finding my feet' with this. 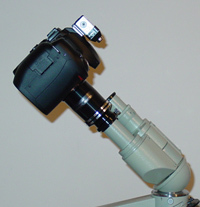 Ideally a sturdy camera mount independent of the microscope is preferred, but as the the desk has to be used domestically after microscopy it's more practical to couple camera to the microscope. F - SunPak 2400 flashgun, an old but powerful and versatile with 6 power settings. One or two SunPak diffusers were used on the flashgun to remove residual light banding caused by the reflector structure. The condenser was just slightly defocussed on light source so essentially the lighting was critical illumination. This was a superior light source to tungsten lighting with the LOMO lamps which invariably needed a diffuser below condenser to achieve even lighting at low to mid powers. T - LOMO OI-19 tungsten lamp. U - Nikon supplied USB 2.0 cable to PC allows immediate image transfer to study on CRT monitor. A - 35mm photomicrography adaptor. This is one of the shorter third party designs and the small projection distance partly compensates for the more limited field of a DSLR. 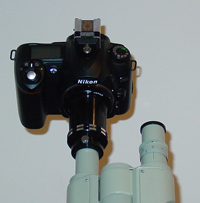 A LOMO compensating or non-compensating 7x normal eyepiece was used depending on objective. For microscopes without vertical tube, the lightweight and compact D50 body does not rule out using it on the LOMO binocular head, ensuring all couplings are secure! The camera weight does not affect the Biolam's stability. Flash would be better than tungsten to remove vibration problems. With interocular distance set at max, visual checking of the view in other eyepiece is just about doable, perhaps even allowing a set-up for parfocality ... another project! Ergonomics: With flash, once the shutter speed has been chosen, there's no exposure controls on camera other than shutter release that are used. If tungsten was used, the setting of shutter speed and self timer could be more awkward as the top LCD status panel (not illuminated) is harder to access and view. The angled set-up on bino' head would allow easier camera control in this aspect. With a small microscope like the LOMO Biolam, the LCD image review screen is at a good height to allow gross exposure / focus problems with the image review features. Focussing: It's a pity the clear centre with split screen has been lost on most DSLR viewfinders as did find it invaluable on my Nikkormat 35mm SLR. Focussing is certainly trickier with the D50 coarse screen but my success rate seemed quite good, apart from at the lowest mag of 3.5x where depth of focus at sensor plane can be very small. Camera focus was only a slightly off the visual focus so shouldn't unduly affect image quality. Flash negates the need for self timer, delayed release etc, allowing images to be taken as fast as the shutter was fired. For subjects / mags where critical focussing was tricky with the camera viewfinder it was possible to routinely make a few fine focus increments either side of visual focus for immediate inspection of images either on the PC or zoom function on LCD. One or more images with different planes in focus could also be stacked with software like CombineZ or Helicon Focus. In fact Helicon Focus was my preferred software for first check of all images read off the card even if no plan to stack, as they are presented in a quickly accessible file sequence and window for checking e.g. critical focus rather than the awkward tiling etc of Photoshop or file browsers. Image capture / transfer / work-up: after some trials these settings suited my set-up. Camera settings: flash white balance, ISO 200, shutter sync 1/250 (1/500 max), shutter button pressed manually. Images saved to card as either 'RAW + basic jpeg' for quality work but most of time preferred just 'fine jpeg'. The image quality difference is subtle unless using full size. Camera connected by USB 2.0 cable to PC allows access to files on D50 card immediately after taking, but found that a PC connection loses the image review on LCD so preferred to store on card without a PC connection for LCD image review. Sensor size and field of view: The D50, as with other consumer DSLR's, has a sensor which typically gives a 1.5x mag. factor cf 35 mm film, so when used with film photomicrography adaptors it gives a proportionally smaller field of view. However, many hobbyists like myself use either the older or less than finest microscope optics which may not be well corrected for either field flatness or aberrations towards the edge, so using a smaller field is arguably a benefit (I've also yet to source suitable photoeyepieces for the LOMO). With the speed of image editing nowadays a few image auto-stitches of static subjects can restore an effective 35 mm field of view if required. Exposure determination: Metering is not possible with the D50 without a lens on, unlike the Canon 350D. This didn't proved to be a problem as after a few trials with different lighting techniques and objectives, suitable flashgun power settings / diffusers / ND filters required were quickly established. Coupled with the instant review of results on LCD and histogram / highlight warning, slight tweaks to the exposure could readily be made. With live subjects a correct exposure for the lighting technique would need to be preset although saving results as a RAW file allows a useful exposure latitude if needed. 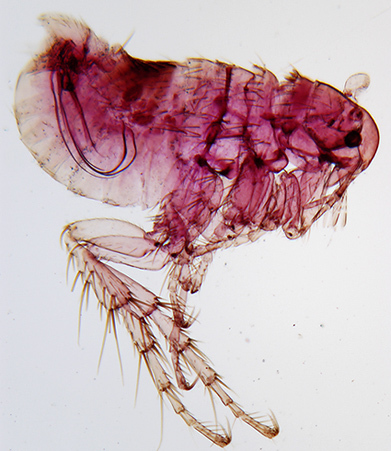 A selection of images are shown below with further notes on how the microscope / camera performed. Work-up: levels and contrast adjustment in Photoshop Elements if needed, these were usually minor changes. A resize from 6 Mpixels used Fred Miranda's 'WP Pro' with 'low sharpening' unless stated otherwise. Fine jpeg setting at full resolution used in camera not RAW. Eyepiece was LOMO 7x or K7x as appropriate. Flash head had 24mm lens diffuser and ND4 filter attached. Flash power varied between 1/2 and 1/32. Critical focusing was, as expected, hardest at this lowest mag through viewfinder because of low depth of focus at image plane. I rarely got a very crisp image and downsampling with 'WP Pro' 'high sharpening' was required. Focussing was easier with this objective. 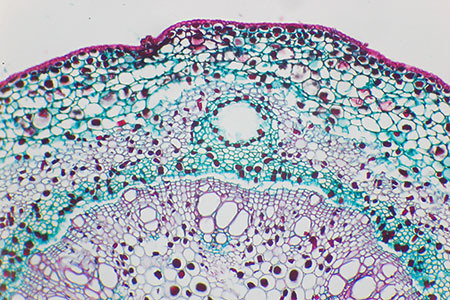 Maritime pine, stained T/S leaf, Biosil slide. 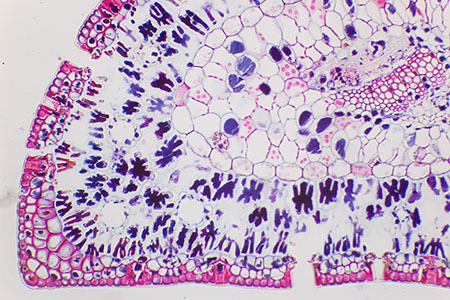 T/S stained cashew leaf, Biosil slide. Radiolaria, Bermuda 'Collection Albert Renaud' The mountant colour gives the warm tone. 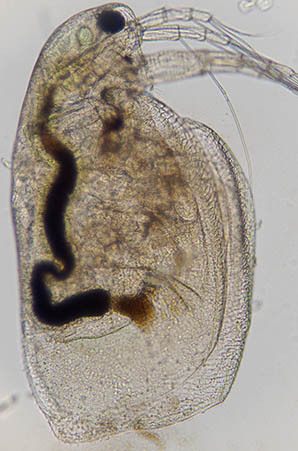 Live Daphnia. If live subjects are immobilised the monocular set-up although not ideal is usable. Both the 3.5x and 9x LOMO objectives can be used without eyepiece but need a ca. 11 mm stop at eyepiece level to stop flare which also gave some vignetting, but did increase the field somewhat as here for larger subjects. Objective: LOMO 85x achromatic NA1.0 water immersion. 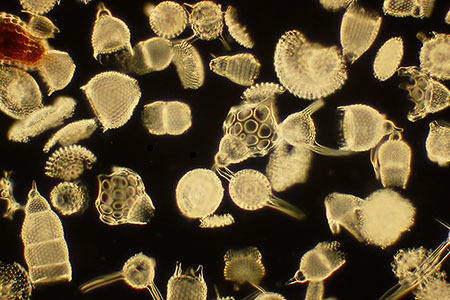 Diatom, Navicula lyra. Klaus Kemp eight form test slide. 3 mm oblique on LOMO aplanatic condenser. Critical focussing at this high mag was possible with viewfinder, but took a few tries sometimes. It was more successful than at lowest mag probably because depth of focus at image plane is higher (as distinct from depth of field at subject plane). The LCD preview with zoom was usually enough to check if focus good enough. The gritty look isn't noise but the flash emphasises any texture in light path. Out of camera these images are very flat but contrast and level adjustments can bring some punch back. 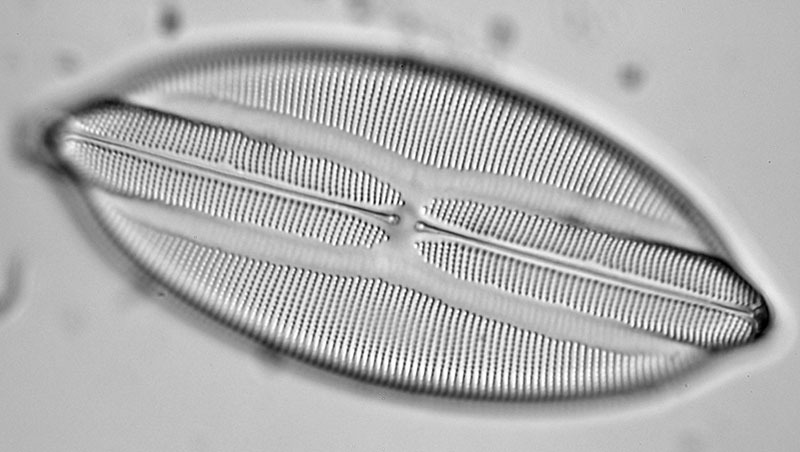 Diatom, Stauroneis phoenocenteron, Klaus Kemp eight form test slide. 3 mm oblique on LOMO aplanatic condenser. The flash has plenty of power at high mag, it was set at 1/8th power, with ND4 filter and '24mm' diffuser on flash gun. Neat Image was used here to remove some of flash grittiness. General comments: The six megapixel Nikon D50 and Biolam with monocular tube gives a simple set-up with vignette free imaging cf my digicam route and relay lens. My main interest in this trial was to determine whether removal of 14 elements of glass between eyepiece and sensor by going from S75 digicam with reversed 50mm relay lens to D50 gave a good step up in image quality. My impression is not really; the S75 gives contrasty, crisp images and easier to focus. The S75 sensor is also sealed cf the DSLR and gives easier live focussing on back LCD with low mag objectives. Although the less awkward set-up and lack of vignetting makes me favour the D50 set-up somewhat, I am a bit wary of the increased exposure of a DSLR camera internals to dust, potentially increasing dust on sensor problems, time will tell. However, the D50 is somewhat of an overkill for modest LOMO optics; large prints are the main draw of multi megapixel cameras but most of the photomicro' images from my set-up aren't good enough to exploit the images at full res. For screen use or small prints, downsampling and sharpening can rectify this. For those with a very good photomicroscope set-up with high quality optics the D50 should be capable of getting the most out of the optics as the lack of metering and mirror lock is readily circumvented, in this case with a flash system. Published in the September 2005 edition of Micscape.